April sure is flying by. We had a little bit of cold weather after the garden was started, but then it warmed up again and everything has started to pop up. 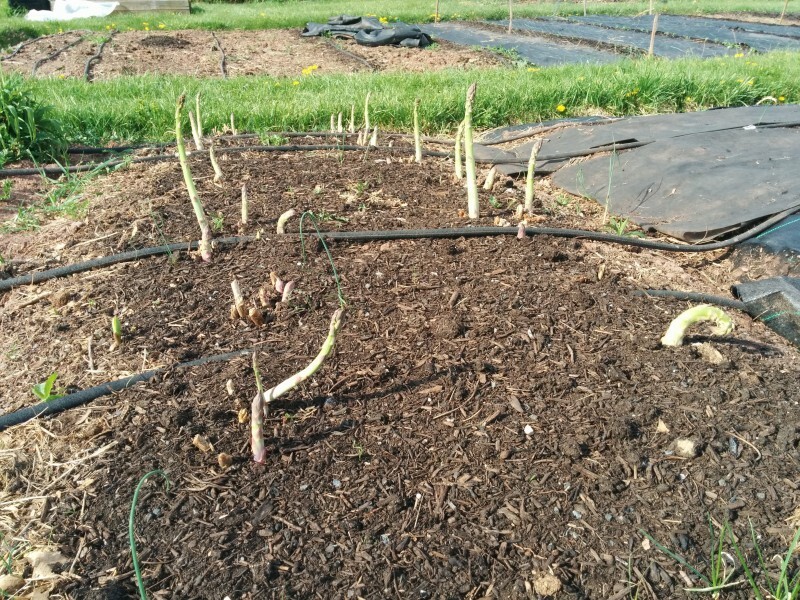 Unfortunately, the first ten or so shoots of asparagus came up and got bitten by the cold and kind of died back. 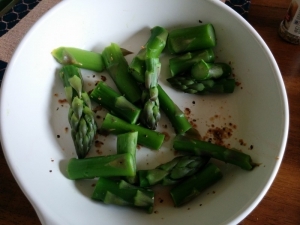 This is year four and our plants are now very strong and as soon as it warmed up just a bit the second round of shoots came up and we had our first plate of steamed asparagus a couple of lunches ago. The spinach came up, but it looked like perhaps slugs got to it, because the tender tip were all eaten. I tried to cover the spinach and the radishes the night before the 22 degrees, but the spinach is just gone. 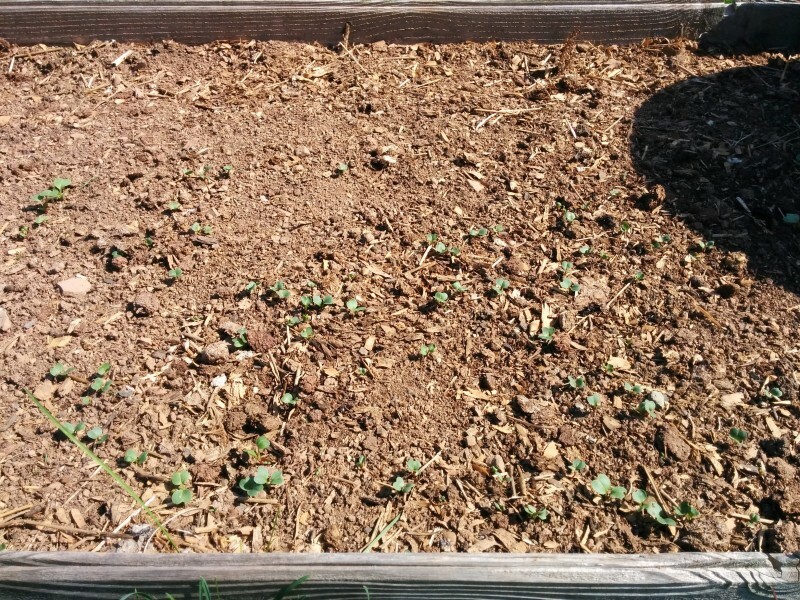 The radishes were chewed up a bit, but survived and now are starting to leaf out nicely. The onions look pretty good as do the snap peas, but the regular peas didn’t seem to germinate as well as they should have. They were pretty much planted directly into the new compost I had delivered and maybe that should have been mixed with some other soil. 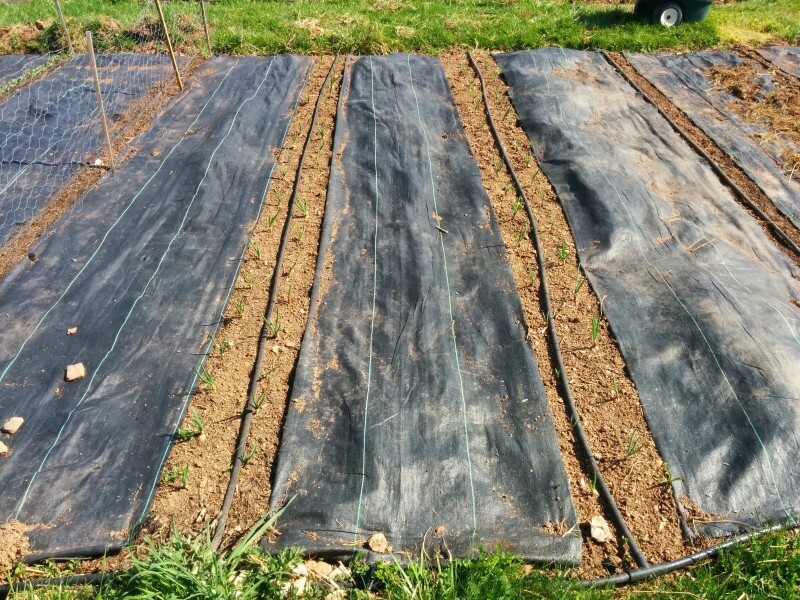 Yesterday I planted two more rows of regular peas which is three and a half weeks after the first planting. Hopefully they will ripen at least a week or two later then the first row. I worked hard on the slightly raised bed where I planted potatoes last year and decided to plant it with potatoes again this year. It is a perfect spot for them and the ground is great for digging. 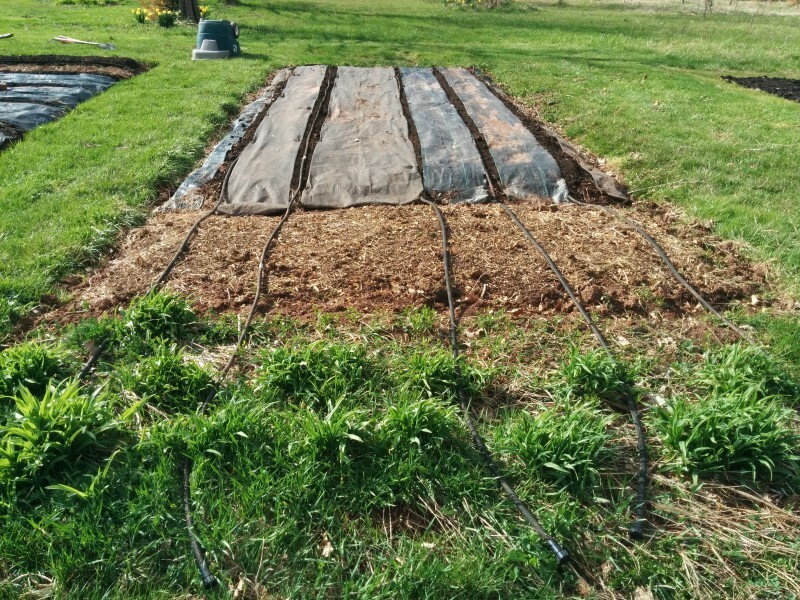 I added a layer of chicken manure and added several inches of the new compost. About a third of the plants are just popping up and they look nice and healthy. 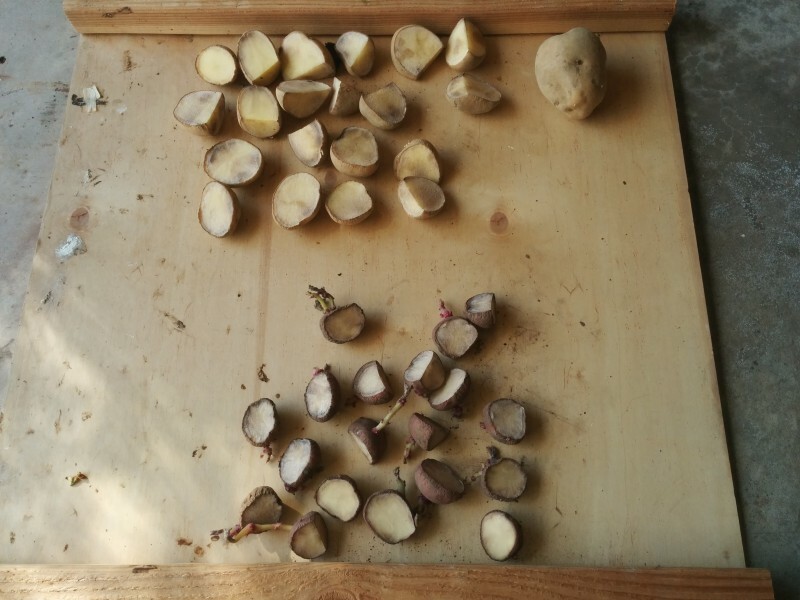 This year I did half Yukon Gold and half some variety of red potato. Once again I am a little late getting the garden started, but after the beautiful weekend, Joni and I made some progress. 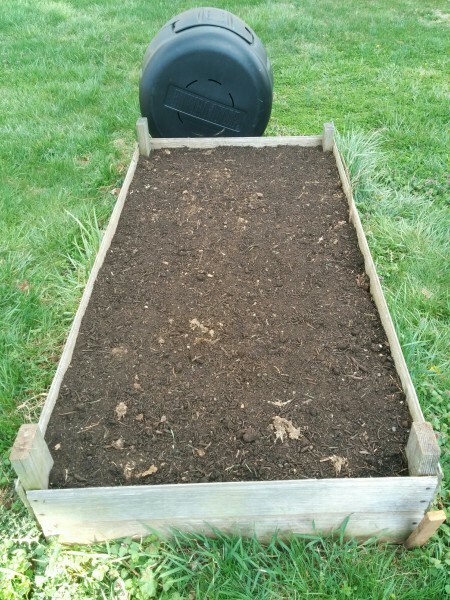 Garden 1 and garden 2 are ready to plant and the new garen 3 has a nice layer of compost. I will be putting all the viney stuff in garden 3 in mounds. Last year I tried to mix bush beans and some tomatoes and eggplant in with the mounds of squash, zucchini, cantaloupe, and cucumbers and it was way too much. It turned into a jungle. It was quite productive, but unnavigable. 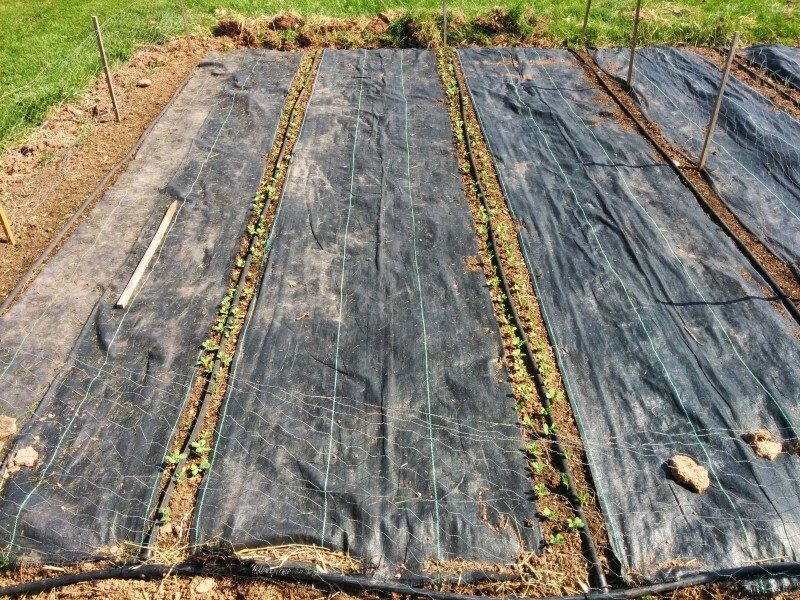 This year garden 2 will just have normal rows of whatever and all the vines will tangle in the new space. 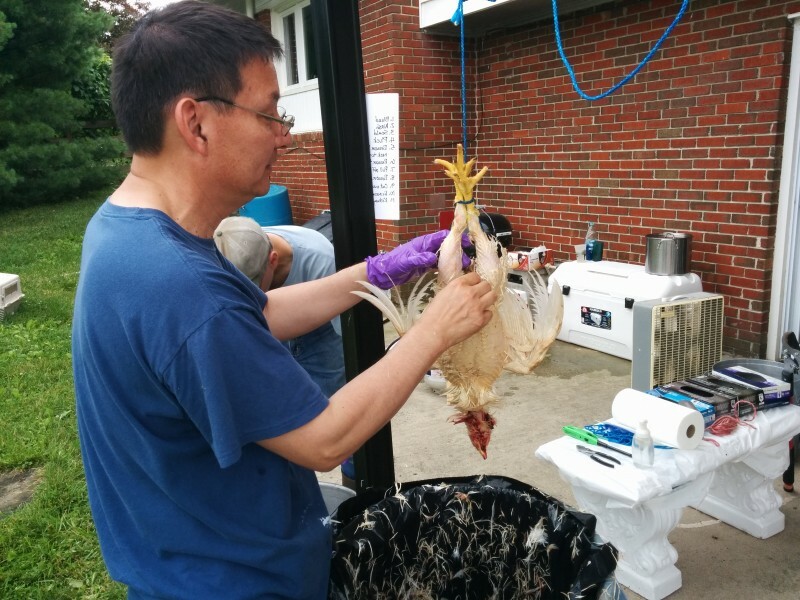 Today we processed our nine meat chickens along with 18 more birds from two other families. This isn’t large scale farming, but the largest undertaking of its kind for us. 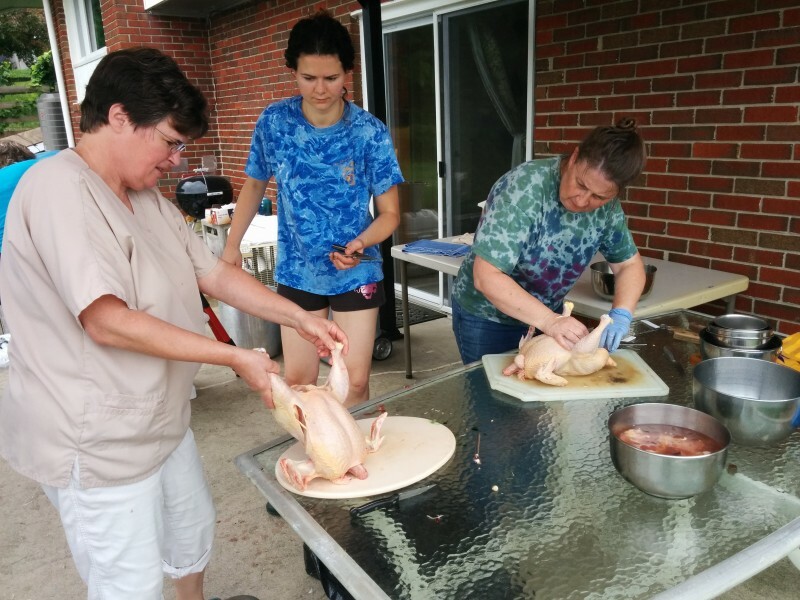 This was the second year for the other families but the first year for us raising meat chickens. These were some generic cross birds we bought at Tractor Supply eight weeks ago. Yeah, Eight weeks! They grow so fast. We have raised several other batches of layers from peeps and they don’t even go outside for eight weeks. And they don’t reach maturity for five or six months. These Cornish Rock crosses grow so fast and have completely different bodies. These are the grocery store chickens that the laying birds are not. 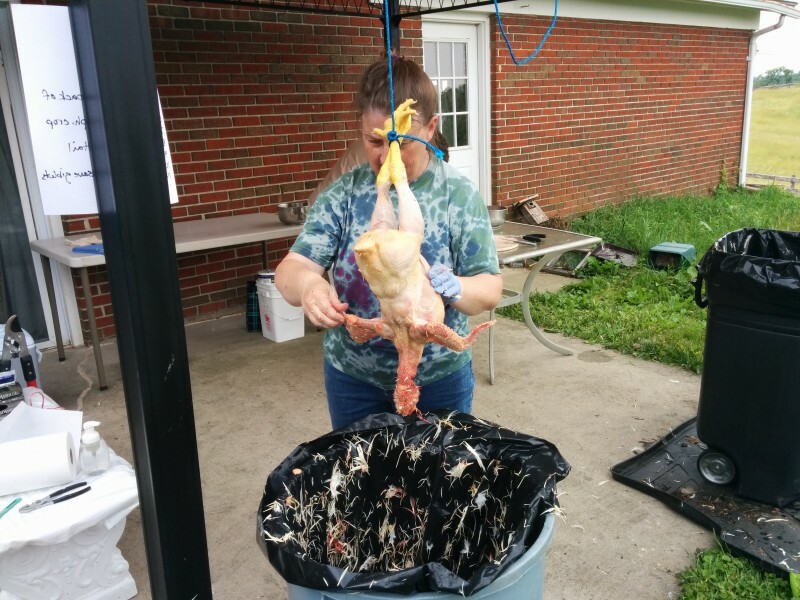 We have butchered some roosters at about six months old in the past, and even though they are large and heavy, they just don’t have the meat on them that these birds have. We had nine people to help with the process and we were quite efficient. 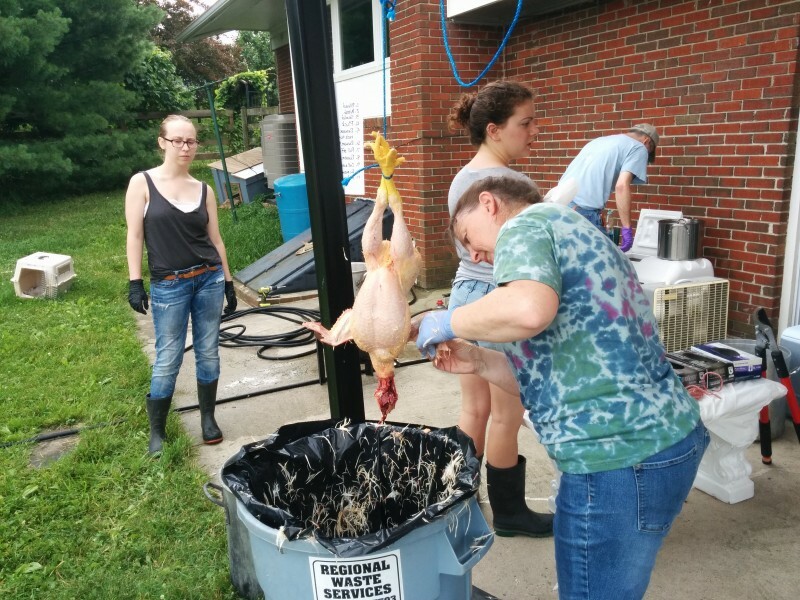 We had a killing cone station, a very large cleaning/rinsing tank, one 150 degree dunking tank (dunking between 50 and 60 seconds), two plucking stations and two eviscerating stations. 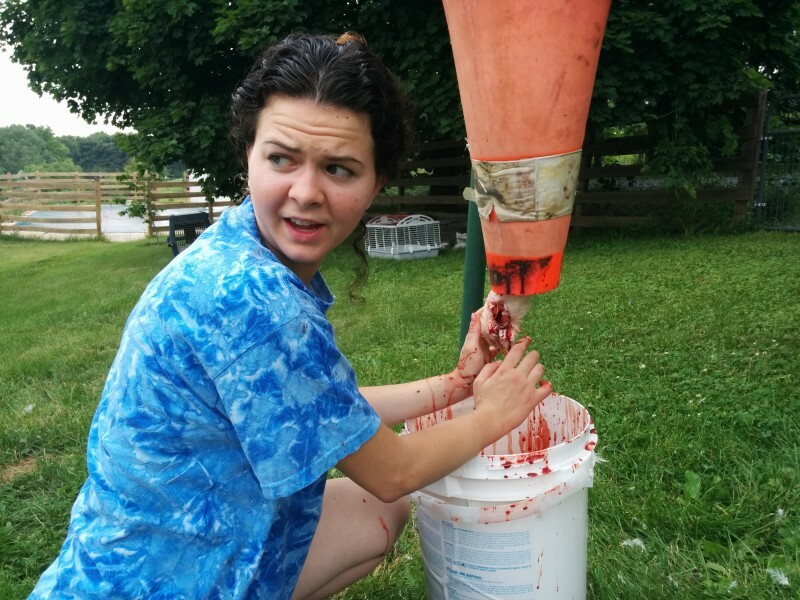 Joni thinks we could have used a third plucking station. We rotated jobs a bit, but Joni did the lion’s share of eviscerating and was very quick about it which was a key to our efficiency and success. The setup was an hour or so and the actual chicken work was only about three hours. Amazing. I was guessing it was going to take most of the day. 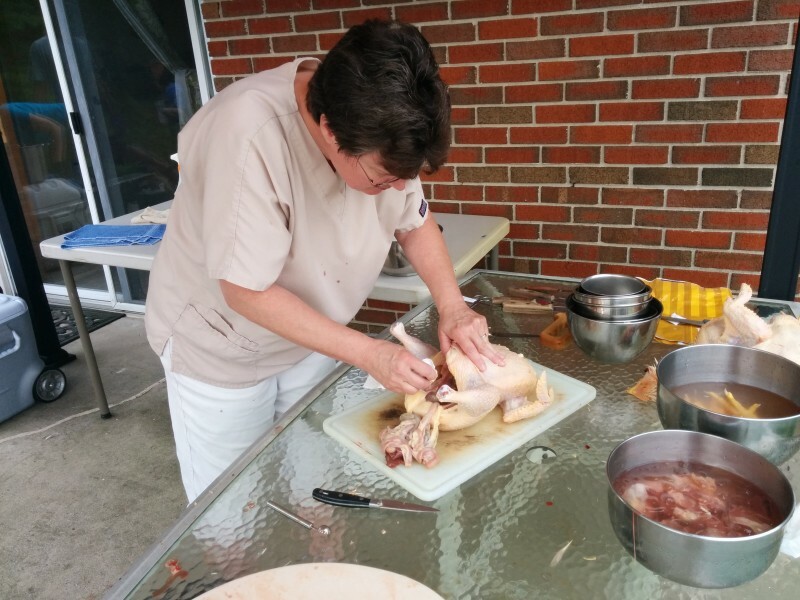 We got all the birds in coolers and went inside for a wonderful lunch. Thanks Hawes family. When we got home, I had to rearrange a bunch of beer to make room in the basement refrigerator. We will leave them in the fridge for two or three days and then put them in better bags for freezing. We decided that the Food Saver 11″ bags won’t quite work so we ordered some of the heat shrinking bags that should arrive in the next couple of days. We will also cut up most of the birds for parts, so these could go into the FS bags. The consensus is that a whole chicken is too big for a family of two, so parts is the way to go. 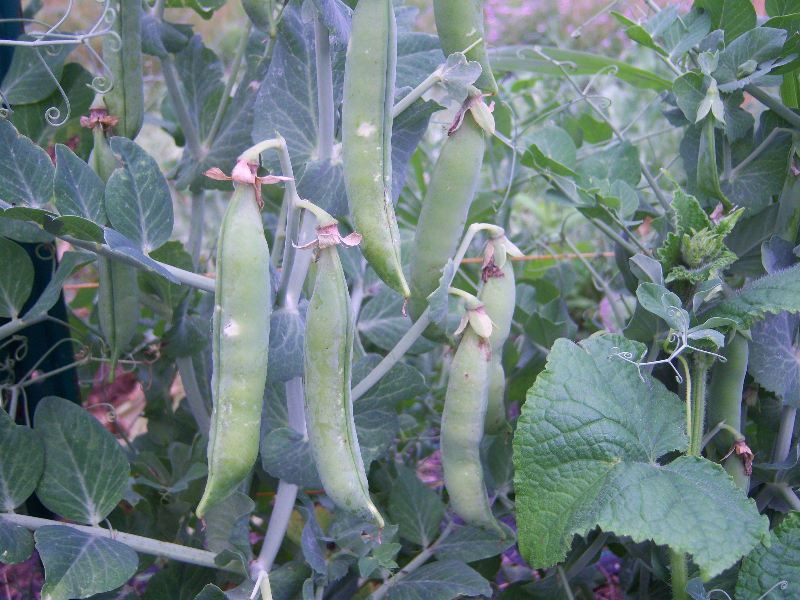 After we had taken care of the chickens for the day, we went out to the garden to pick peas. 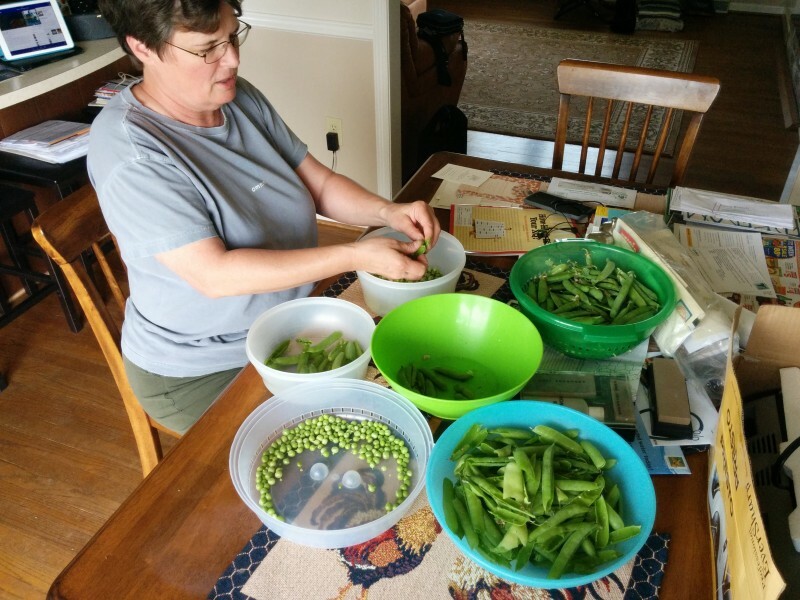 We got a few snap peas, but mostly picked regular peas. We got a couple of bowls full and shelled them. It’s a lot of work for what seems like a small yield, but we both really love them. They are one of the best vegetables to freeze. They are almost like fresh when thawed. We spent most of the day working hard for our food. We thought about how this was a way of life many generations ago and were kind of glad we didn’t have to do it every day. But it was a very satisfying day for us. The garden got a bit of a late start due to the long cold winter and subsequent wet start to spring. 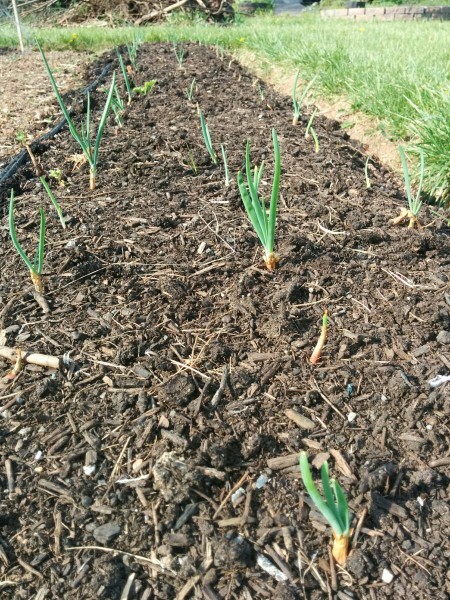 My Grandfather used to always plant onions, lettuce, and peas on St. Patrick’s Day, so every year when that passes me by I feel like I am already behind schedule. This is the second year since my tiller stopped working and I have gone to the no till system. 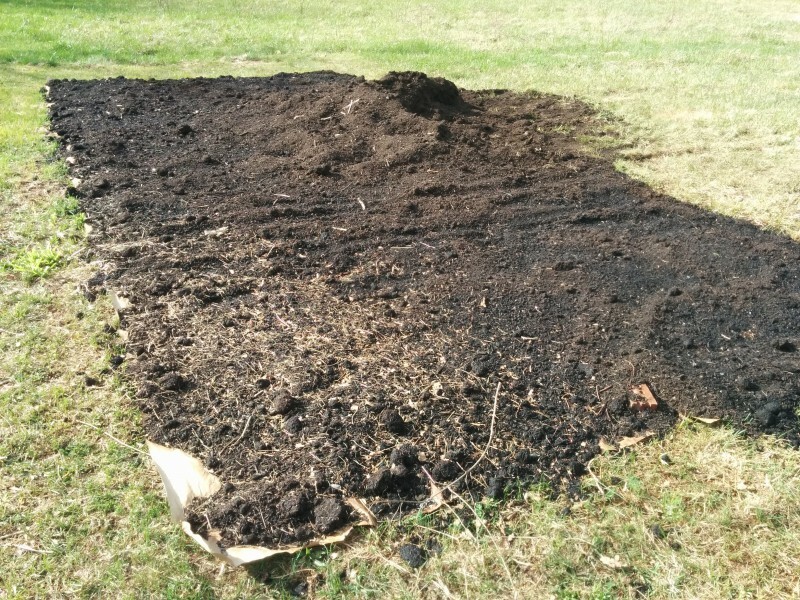 I like the philosophy of not breaking up the soil and instead adding compost on top. 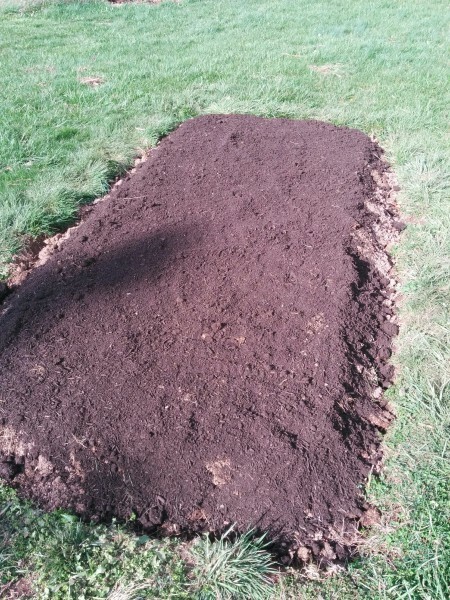 I didn’t buy any compost this year, but instead I have been spreading my own compost made up mostly of chicken poop. 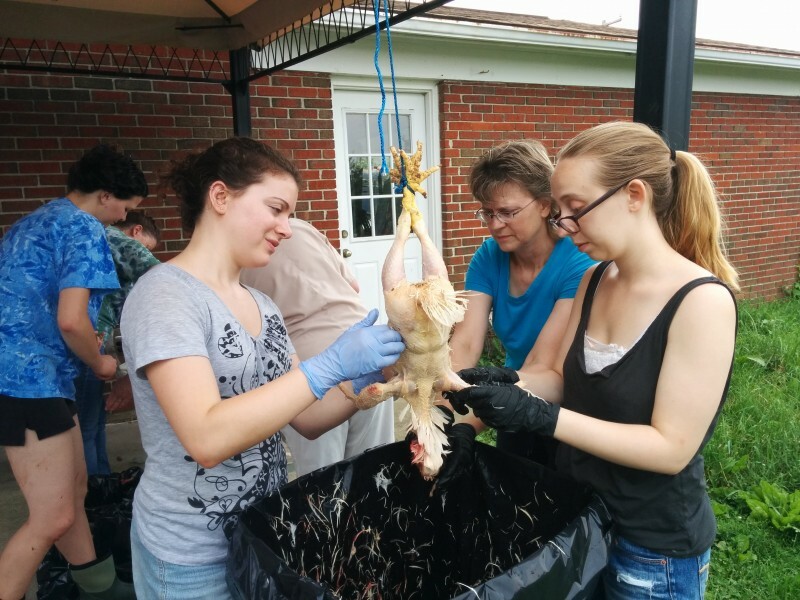 I also dump the kitchen scraps, Guinea pig waste and some yard waste. It is pretty rich stuff, but I didn’t turn it enough last year so most of it is still uncomposted. I will have to work on my technique. I have been able to use some on the garden and I hope it is enough. 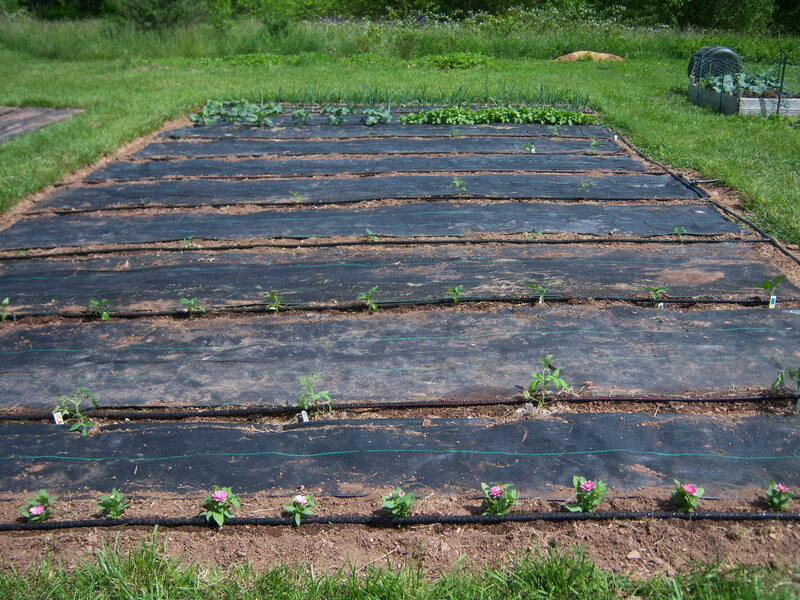 Of course, I also rotate where the various crops will be. The potatoes in the raised bed did very well last year, but I am moving them to the old strawberry mound along with lots of compost and some straw to lighten up the soil. 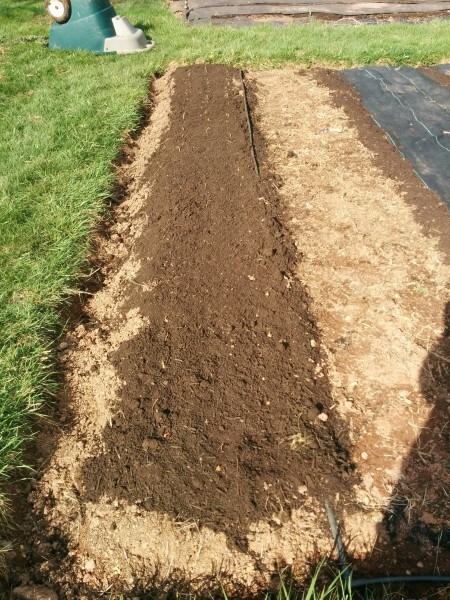 The potatoes need lots of loose soil. In the raised bed I have planted carrots, radishes and some spinach. I think they will do well. 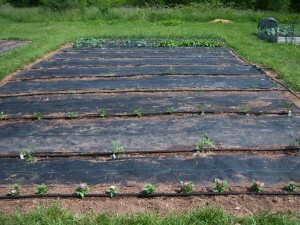 So far in the main garden area I have planted snap peas, pod peas, lettuce, beets and onions. They all look so good this time of year. 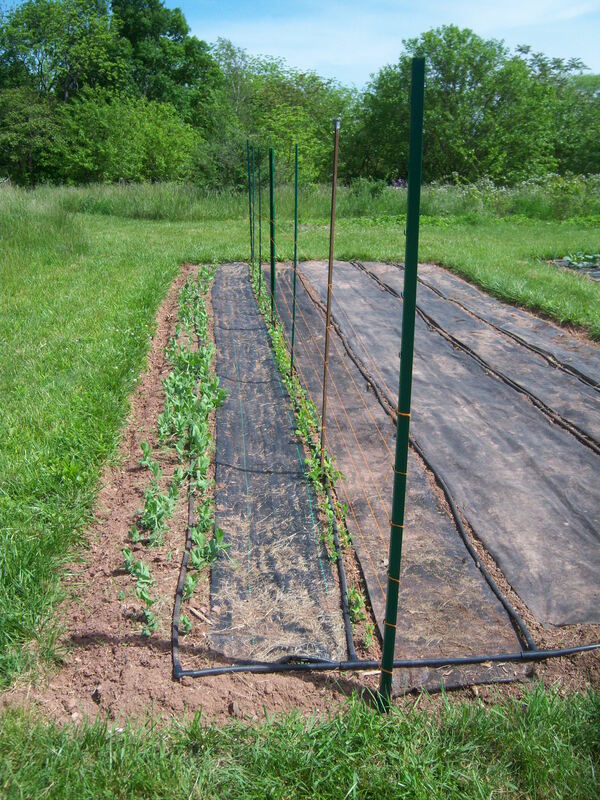 I remembered to put up a fence to keep the bunnies from eating the tender top of the peas which they have done in the past. 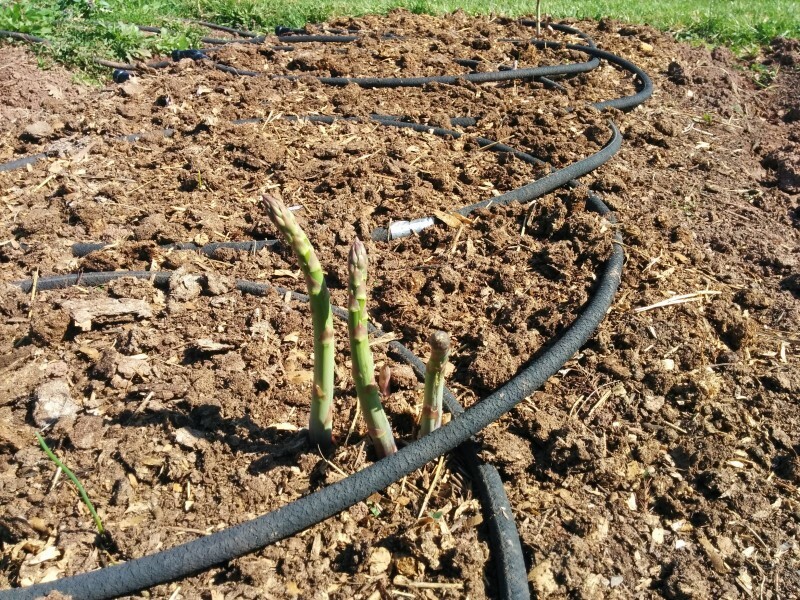 There is nothing yet in the second area except for the third-year asparagus plants. We have already had one dinner of the asparagus and it is a real treat. We didn’t harvest anything the first two years and I think we now have great plants. 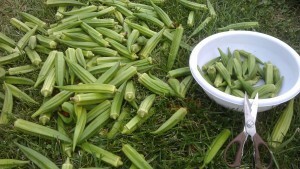 I did my best to keep up with the okra this year, but in the end, the okra was just too much for me. For the past two months I have been trying to cut okra every two or three days. When it was the third day, I would have to cut and discard about a quarter of the harvest and the rest was a little bigger than ideal. Cutting every two days was better, but in a perfect world, I would be harvesting every day. Well I have found that the world is in fact not perfect and about a week ago I just got busy and didn’t get out to the garden at all. I finally got around to looking out at the garden and there was the okra just mocking me; these giant spears atop six-foot tall stalks. It’s a shame to let so much go to waste, but I have already blanched, sliced and frozen lots of bags of it, I have shared some with other okra-minded folks, and I have several large bags and bowls of it laying around the house. Okra is a hard sell to many people. When I tell them I have okra to sell or trade (even give away), I am usually met with a sour face and a comment about gooey slime. I try to tell them how delicious it is cut fresh and roasted or put in soup, but they usually pass. Their loss has been my gain – until now. Now it is the compost pile’s gain. If I run out over the winter, I’ll be amazed and disappointed, but that seems unlikely. 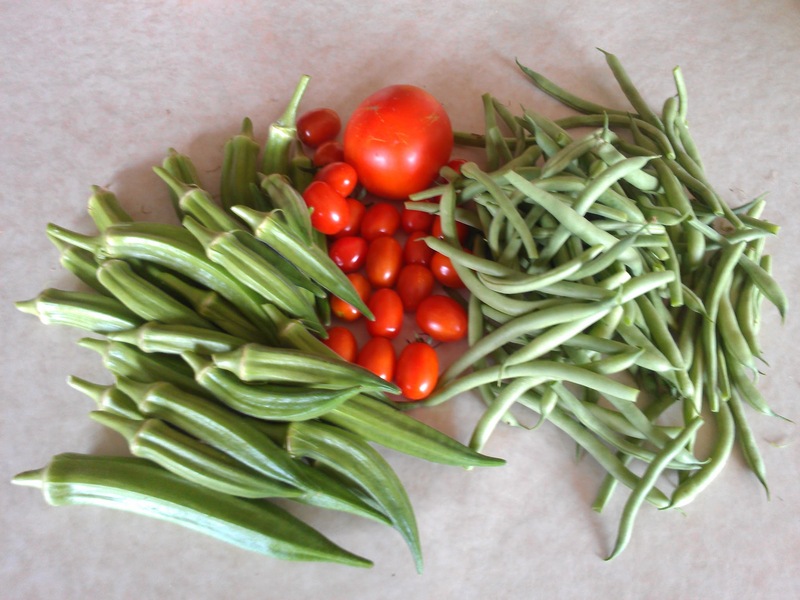 I picked some green beans, okra and tomatoes from the garden last night. 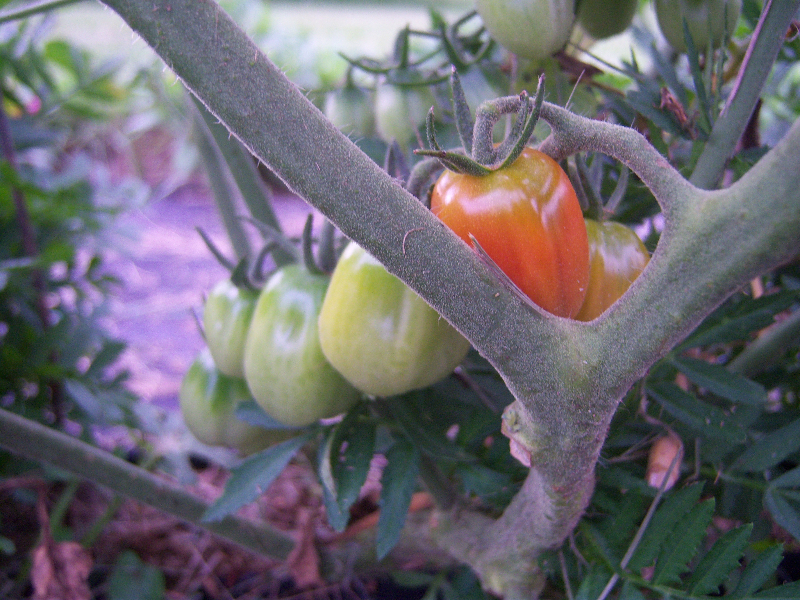 The grape tomatoes are really coming on right now and this is the first of the larger ones. The Romas look like they will take a while longer but we did plant a lot of those this year and we are going to be very busy making salsa, pasta sauce and canning in a few weeks! 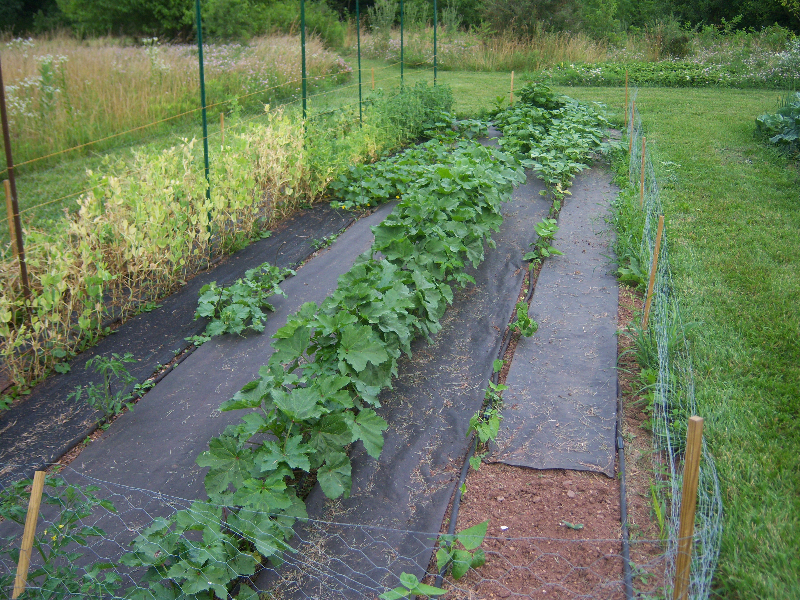 The green beans are just about finished in this crop but there is another half row that should be ready to pick soon and I plan to plant some more of a pole variety this weekend as soon as I get the spent pea plants pulled and that section of the garden cleaned up. The Annie Oakley okra is so yummy and I will work on getting more of that in the freezer. It is really good to add into soups through the winter. 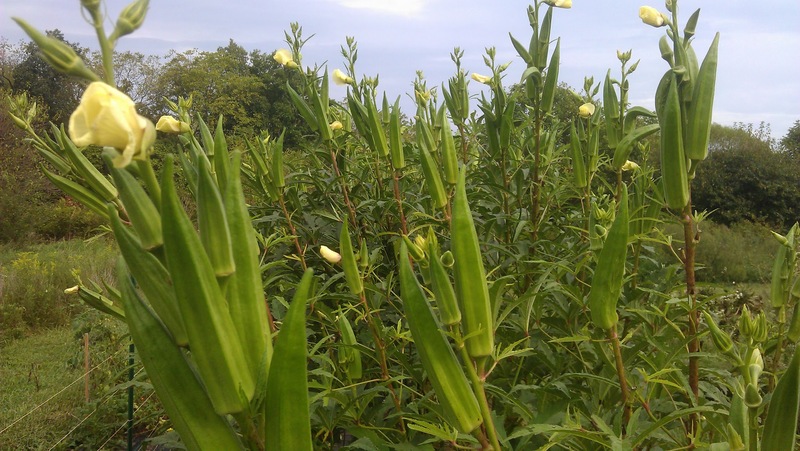 The other variety of okra has produced taller plants that are now blooming so there will be even more to eat/freeze very soon. The garden looks pretty good. For the past week we have had some very hot weather and just one day of rain. 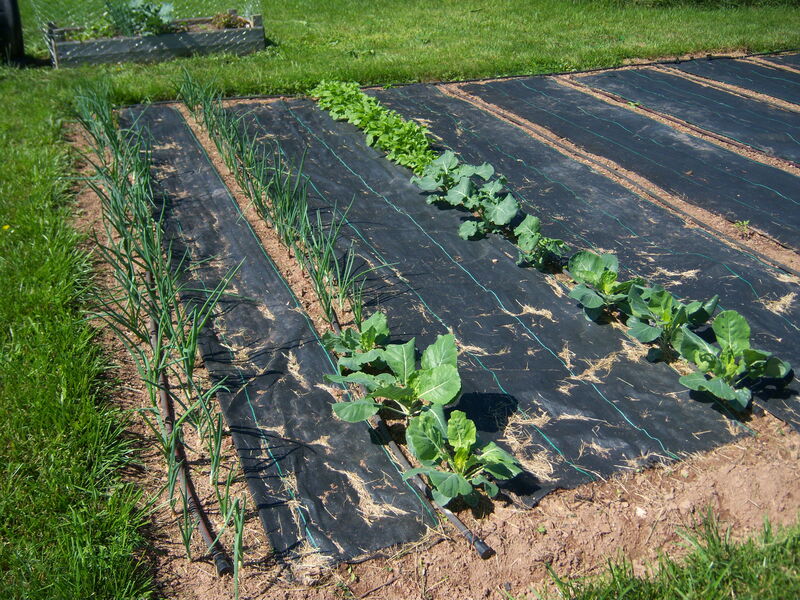 The soaker hose seems to do the job when it won’t rain, but the plants can tell the difference. There is no substitute for a real drenching rain. The tomato plants look good. We picked the first couple of grape tomatoes, but it may be a couple more weeks before we can harvest the bigger varieties. 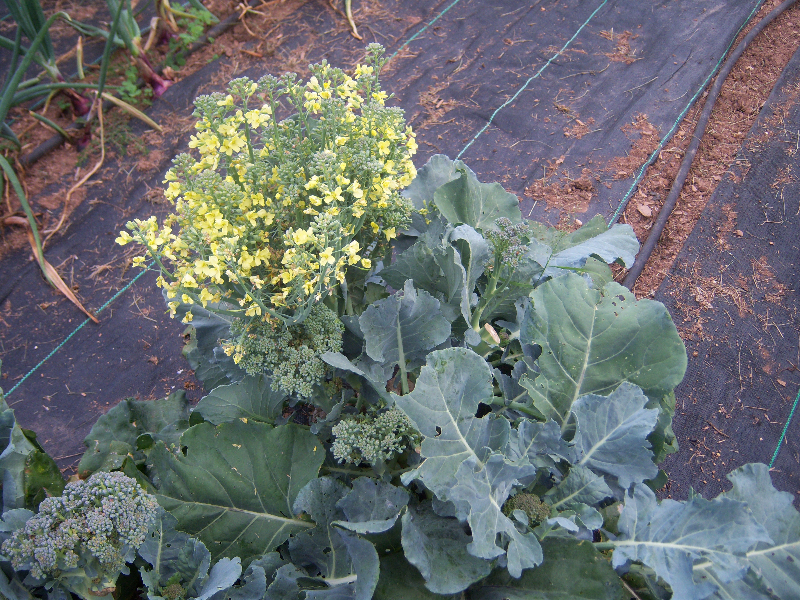 We have let some of the broccoli flower and it turns out that it is pretty and the honeybees like it. Who knew. I picked one small orange Hungarian Wax pepper and the rest are coming along. It was nice and ‘spicy’, by-the-way. 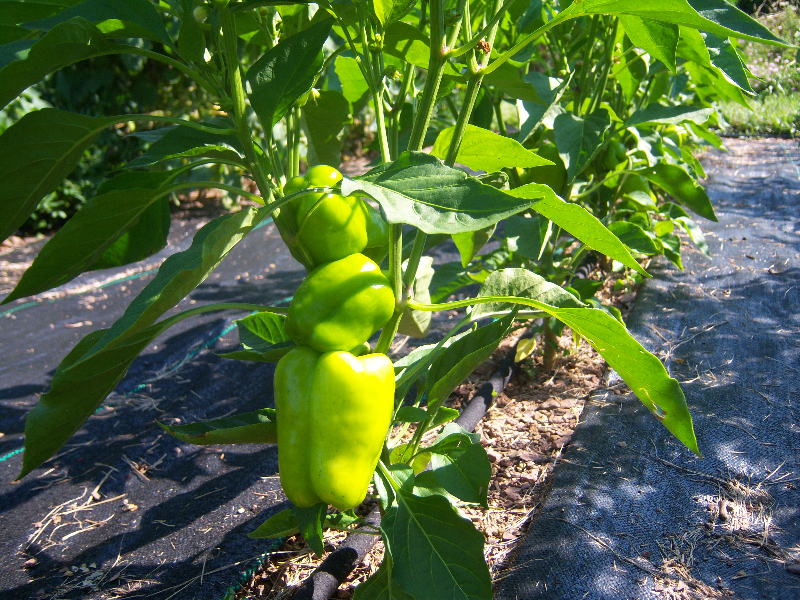 We planted more bell peppers this year because they seem the most versatile and we will use them. One Jalapeno plant will do for this year. 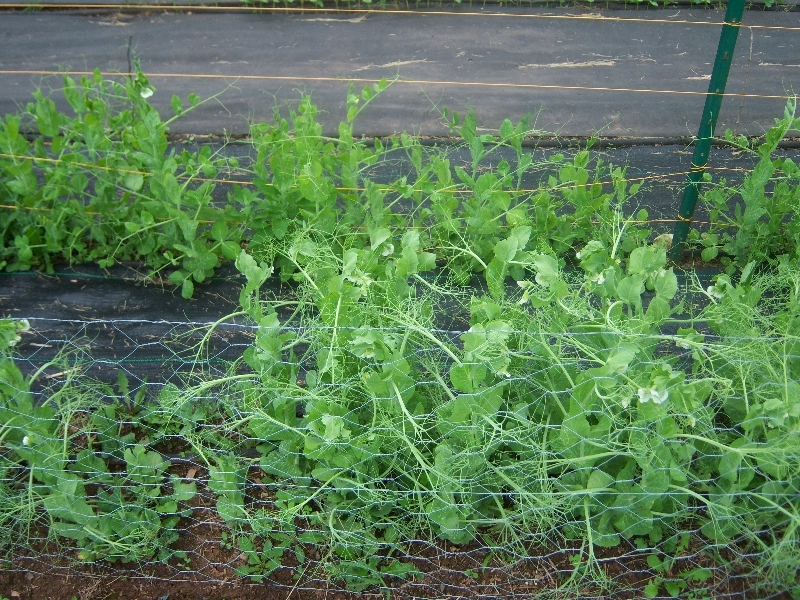 The peas are just about done. We froze some and will freeze more as soon as I get around to it. I don’t want them to sit in the refrigerator much longer. 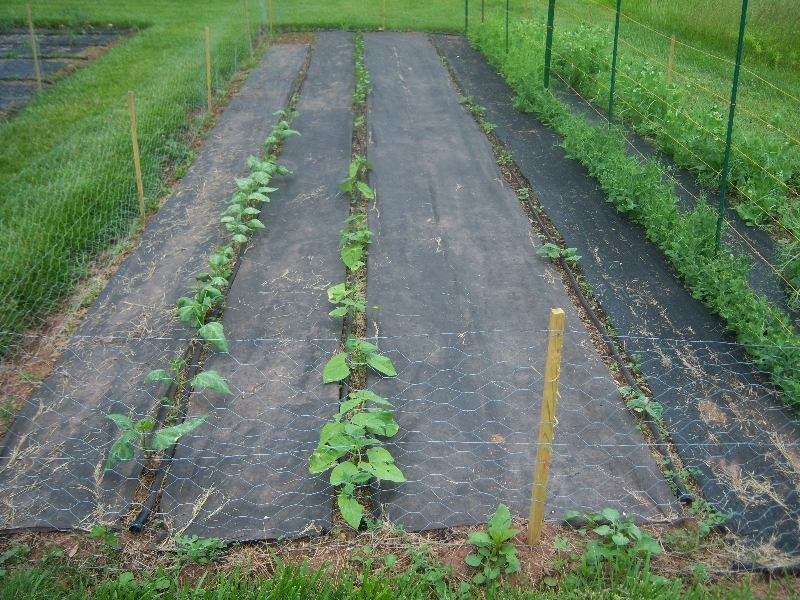 When I pull those plants next week, I will plant another bunch of cucumbers and pole beans. The okra looks as good as last year, but it has another couple of weeks to go. There are some flowers forming. 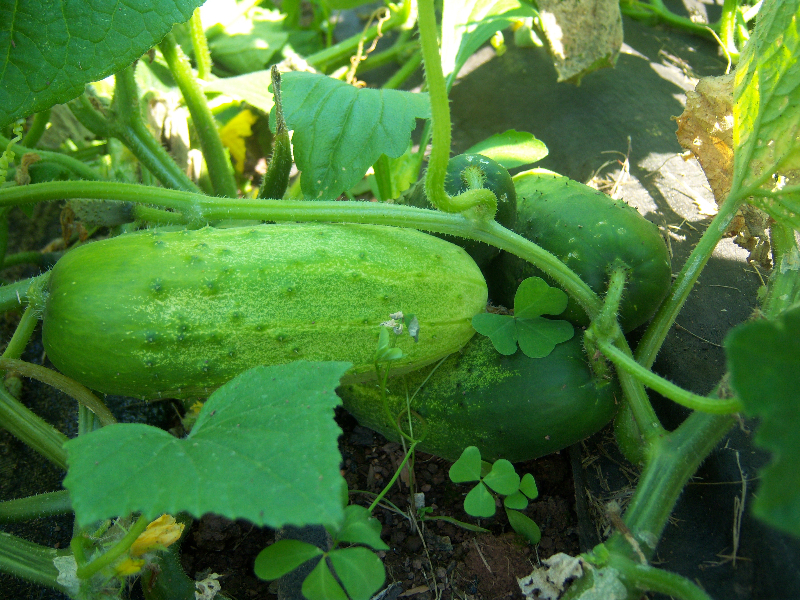 I will probably pick the first few small cucumbers in the next day or two. They are perfect pickling size now. 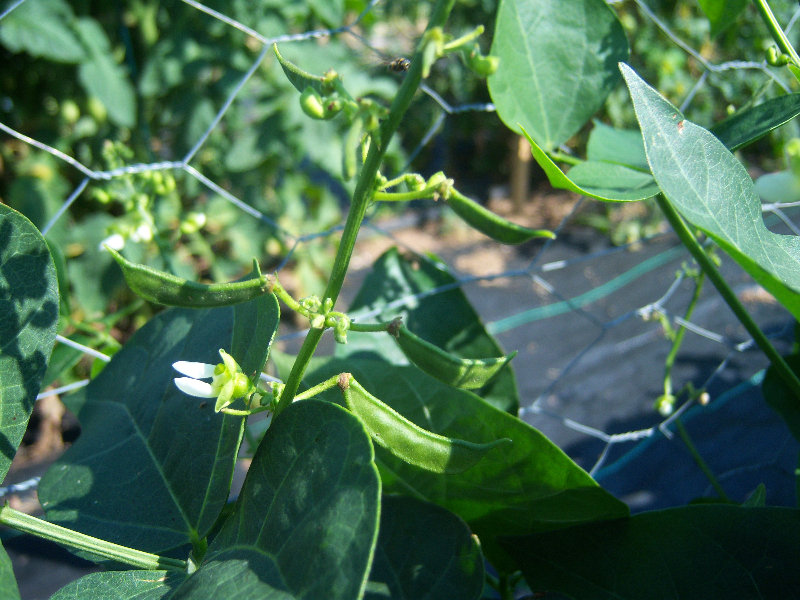 There were some germination problems with the beans and edamame, but the plants that made it look good. 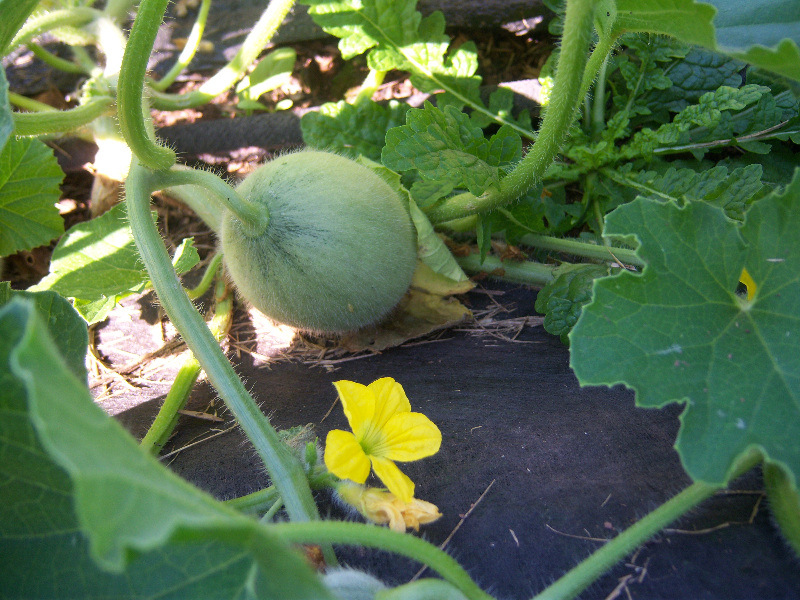 The problems are with the vines: the cucumber, watermelon, cantaloupe, and squash. Germination was terrible, the rabbits ate the early shoots, and now the plants are dying. It seems like a root or stem problem. I think the soil is not as good as it should be in that part of the garden. 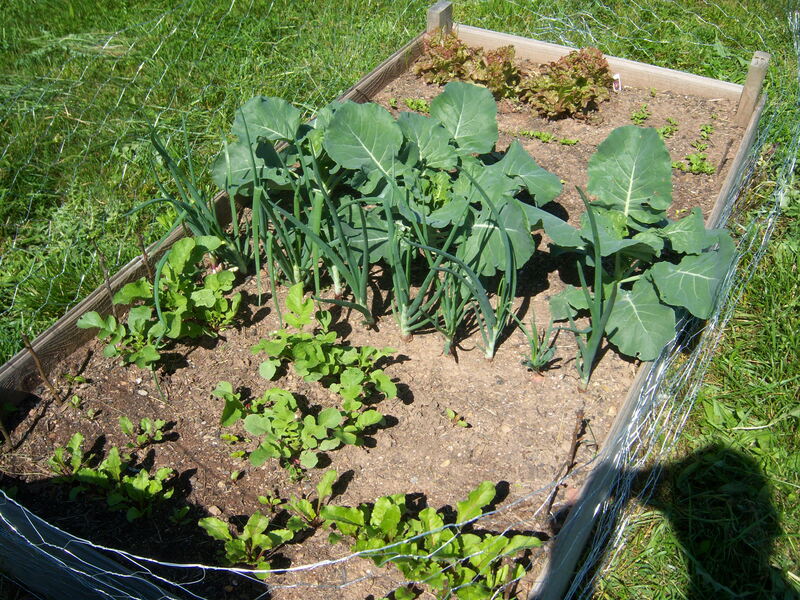 I will plant some in another section when I pull out the remaining broccoli plants. The garden looks pretty good at this time of year. 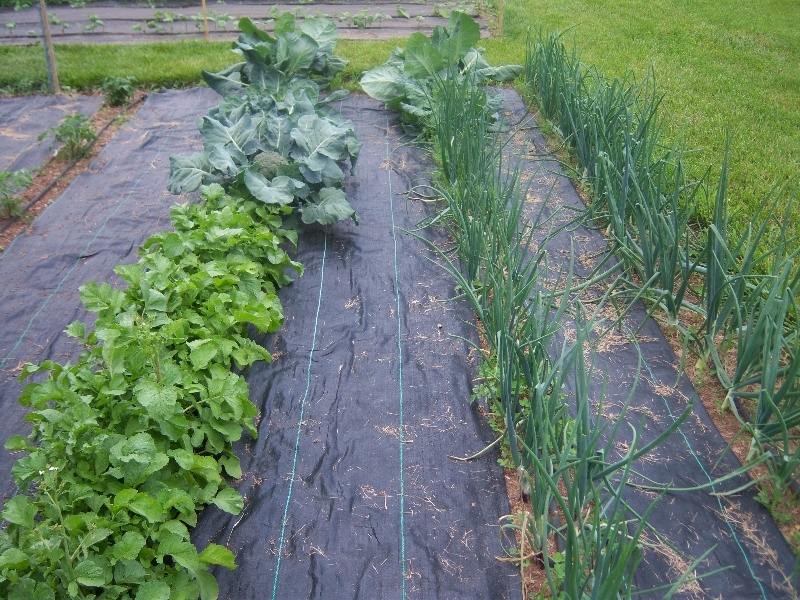 Some things are already being harvested (radishes, lettuce, spinach, and broccoli), and the rest of the plants look good. The weeds aren’t too bad yet and the bugs are just getting their bearings. This week’s exciting news is that we got some broccoli. 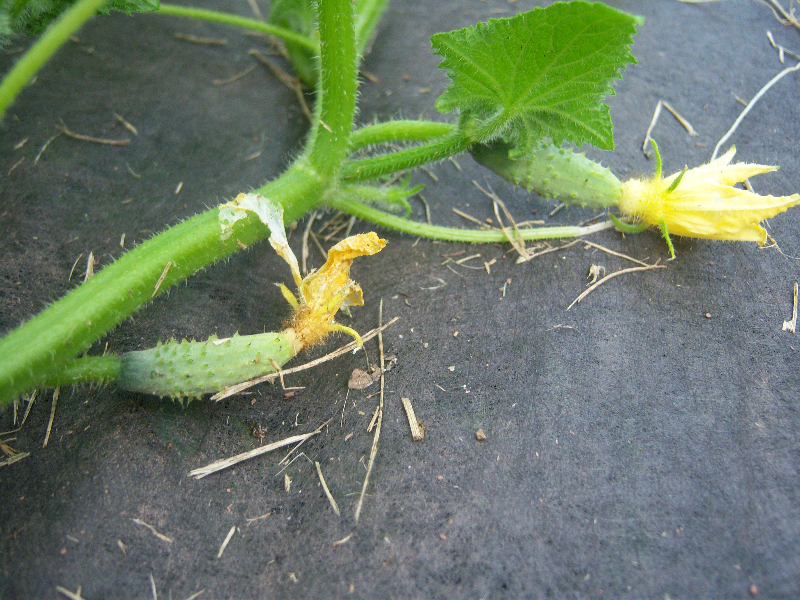 We have never grown it before, but it was easy, fast and in the end, delicious. 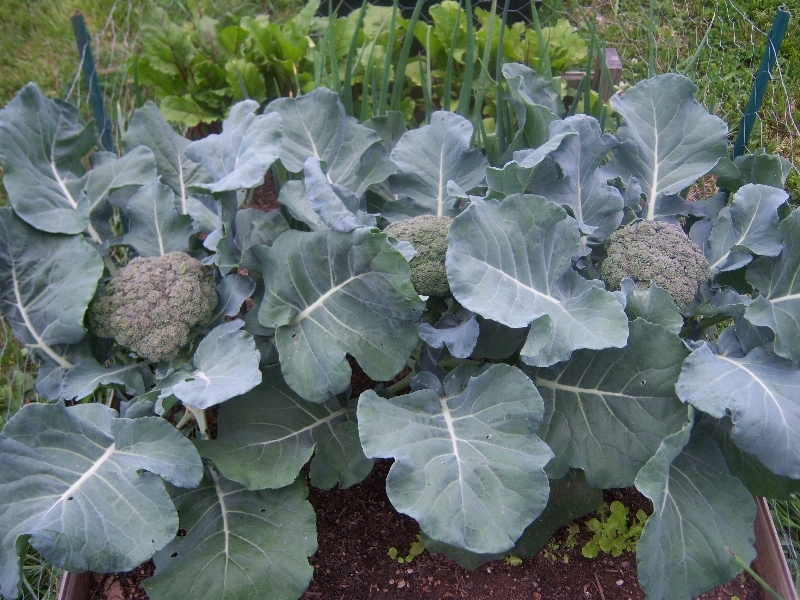 It looks like we will get one nice head of broccoli for plant (we have five), but we think there may be a small secondary head or two that form just below the cut. Here’s to hoping. 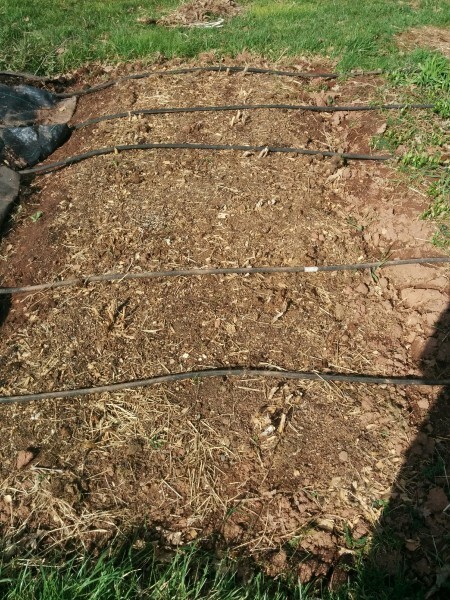 Today I also planted another half row of bush beans (Derby) (about 2.5 weeks from the first planting). I hope to do this two more times at two to three week intervals. 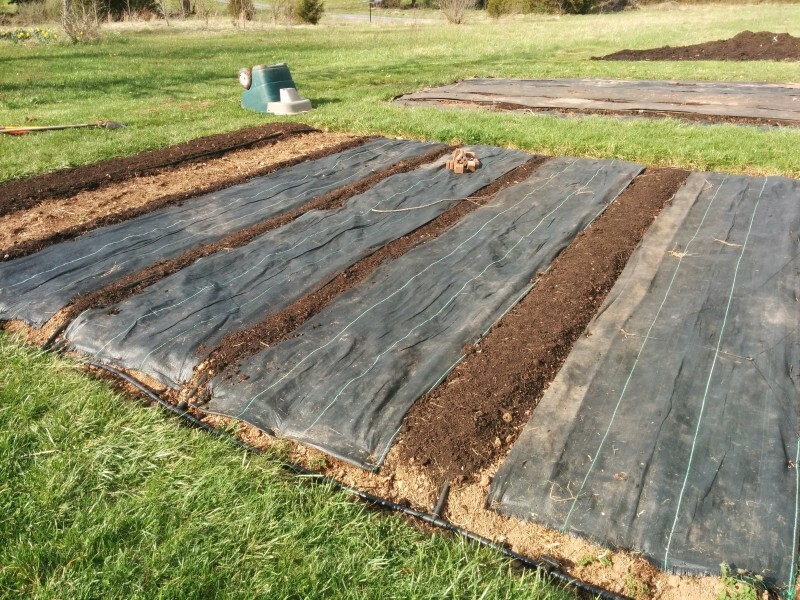 This past weekend we planted most of the garden space. 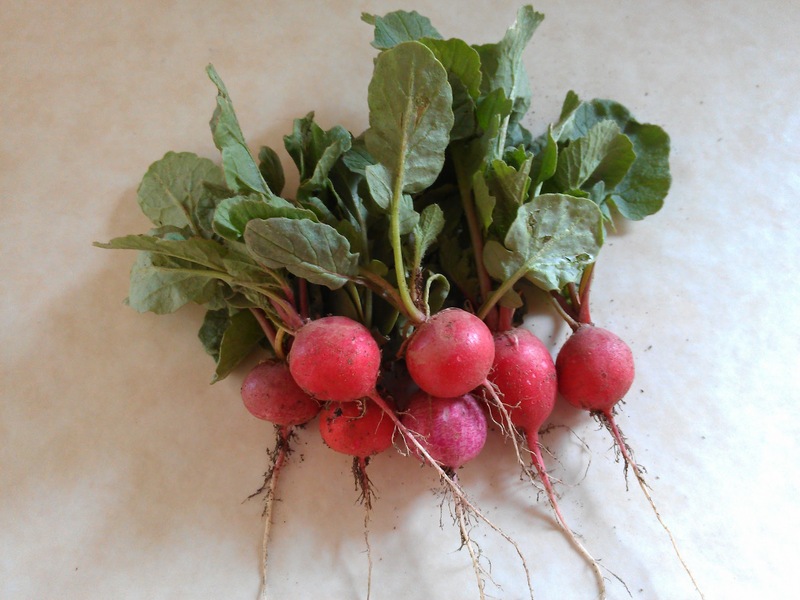 We have been harvesting radishes almost daily, but the garden has not produced anything else yet. The spinach and lettuce didn’t do very well this year. We didn’t plant much and something ate the tender little tops once or twice which didn’t help. Three of the six lettuce plants that I bought at the store died suddenly. They were chewed off or rotted right at ground level. The beets didn’t germinate very well, but the few that did have finally started to grow a little bit. We might end up with 10 beets. 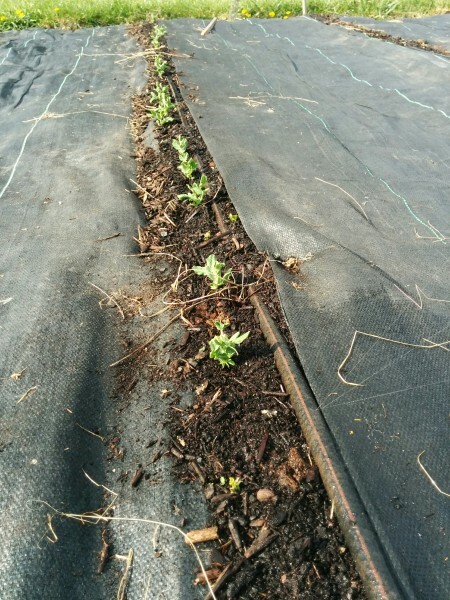 There were also two small eggplant plants that had the tops eaten down. The first plant before I put up a two foot fence and the second one after I put up the fence. Something seemed to have climbed over the fence, pulling it down somewhat in the process. I reinforced it and I am hoping that will be enough. I am also hoping that the little plants come back. I bought one replacement today. This was all in the small raised bed garden. 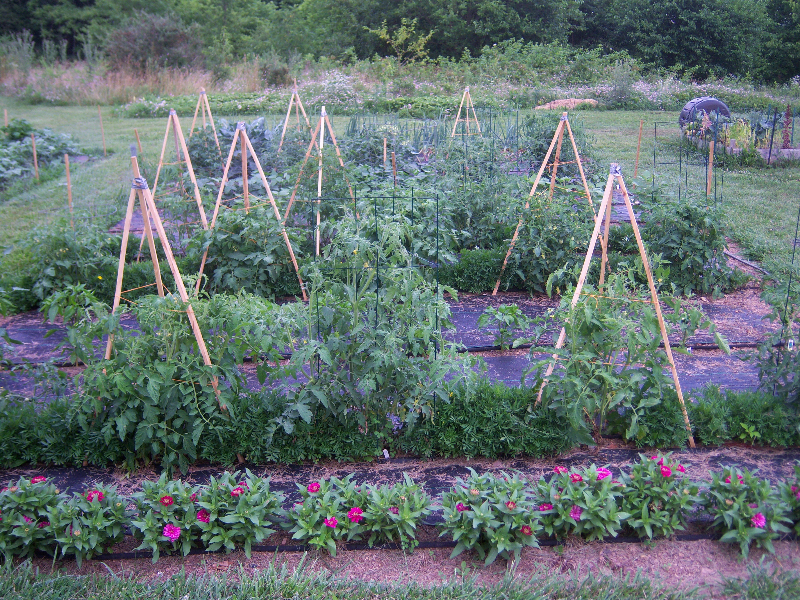 The main garden plot was filled out with a bunch of tomato plants, peppers, edamame (soy beans), and lima beans. 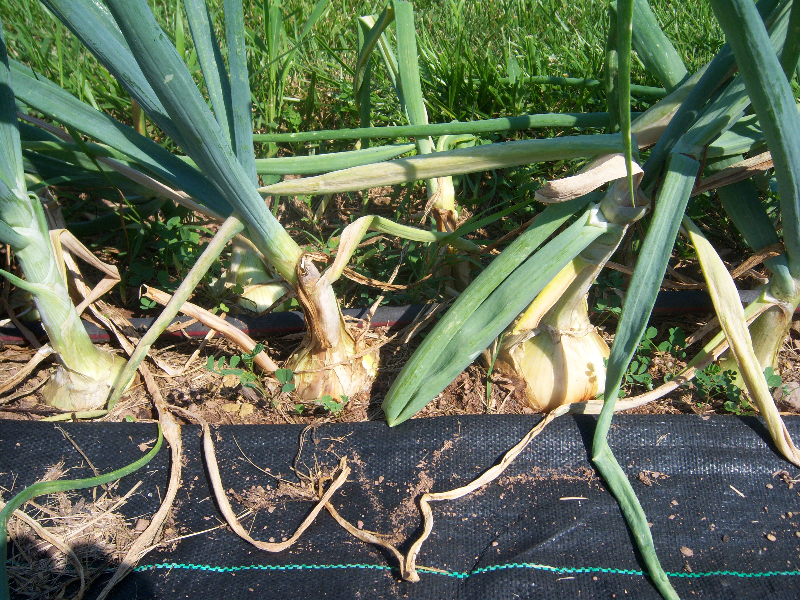 The onions, broccoli and brussels sprouts look pretty good, but the onions are sending up flower stalks. We snapped them off this year although Joni thinks that it might not help. Maybe they are already slowing down bulb development. We’ll see. This is the first year trying broccoli and brussels sprouts so we shall see how they do. I am expecting a great big green plant with some small barely harvestable parts, but maybe I will be surprised. Not setting my sights too high for these. We spaced out the tomato plants a little wider this year and put some rows of peppers in between. 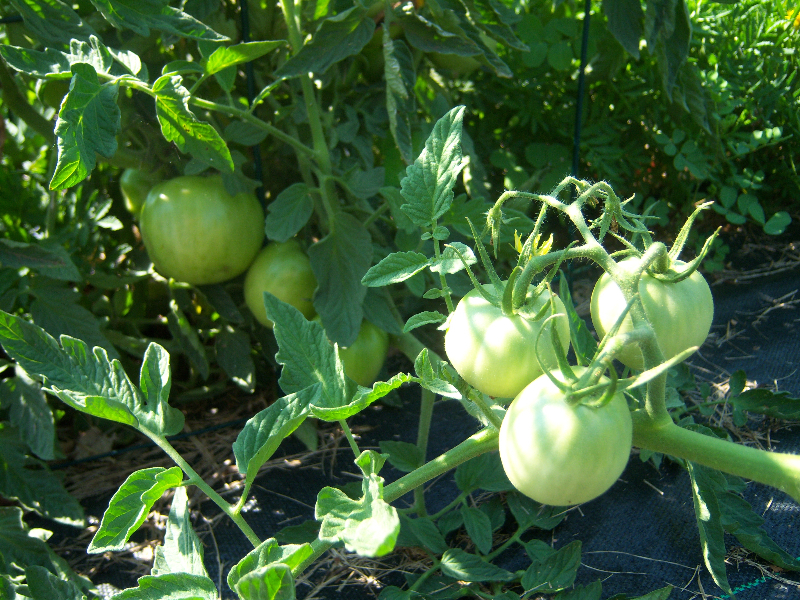 We are really looking forward to harvesting and canning lots of tomatoes, tomato sauce and salsa. 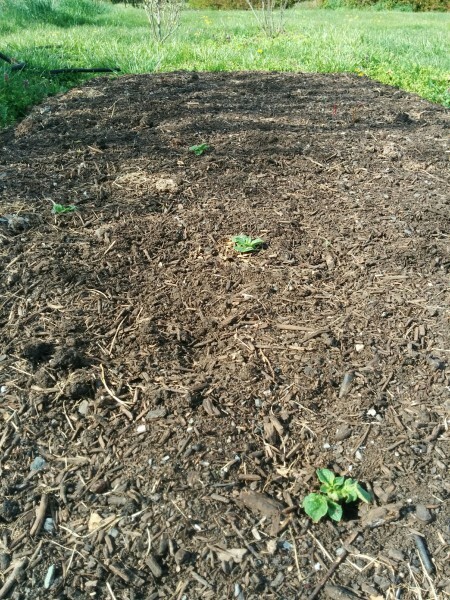 We planted six Roma plants, a few heirloom varieties, a Better Boy, Early girl, Supersonic, a Cupid grape tomato plant. 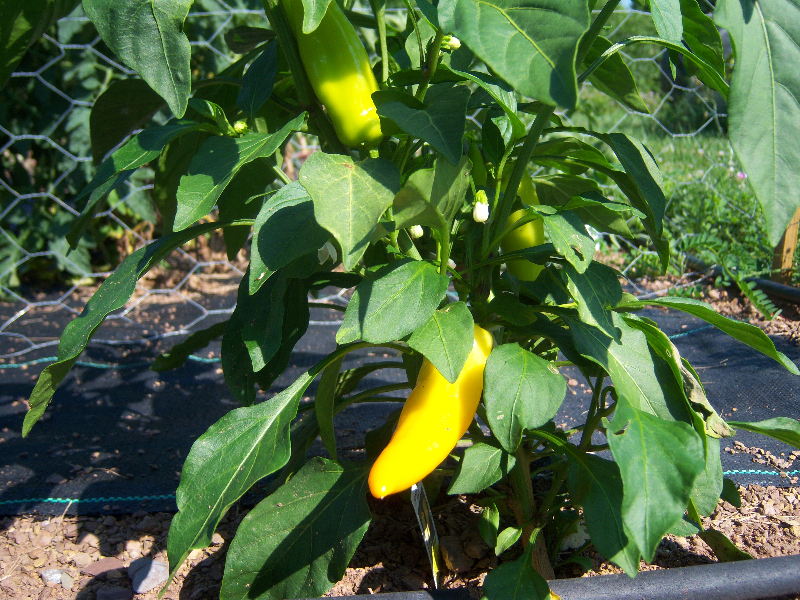 We planted several orange bell peppers along with a Jalapeno, a couple of sweet banana and a Hunganian Wax pepper. 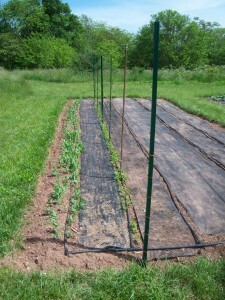 In the secondary garden area, we planted a second row of peas and put up a trellis. The original triple row of sugar peas are doing pretty well. I’m not sure how well the three plants will do climbing over each other. It might be hard to find the peas in all that tangle. 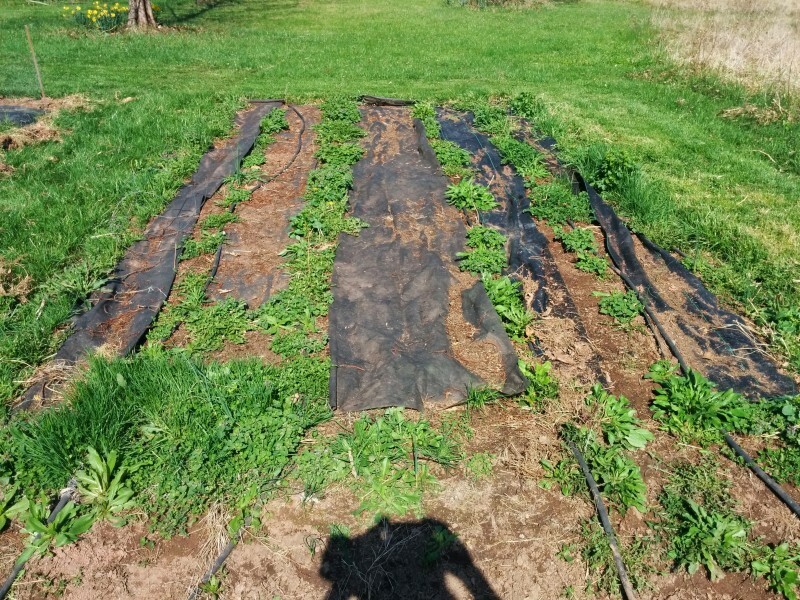 We planted a half row of Derby bush beans with a half row of Fordhook lima beans and another half row of something (maybe a different bush bean), but I left a row and a half for planting in two week intervals. I hope I can stick to the schedule. Right in the middle row I planted a series of viney plants. From west to each it contains: Turkish eggplant (seeds), watermelon, Blenheim Orange melon, Zephyr squash, Gurnet’s Lil’ Sweet cantaloupe, and Miss Pickler “Pioneer” cucumbers. That’s going to be a jungle in a couple of months! I can’t wait to hack my way through that erea in search of fruit! First Harvest from the Garden! It’s so exciting to get the first veggies from our garden! 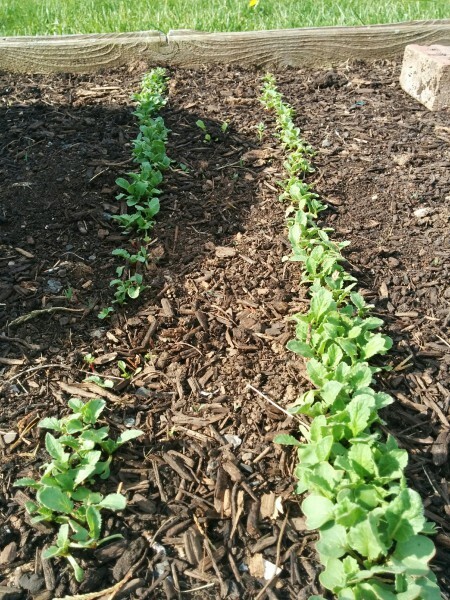 The radishes are growing well in the raised bed and some that we planted in one of the large gardens are looking great for harvesting in another week or so. 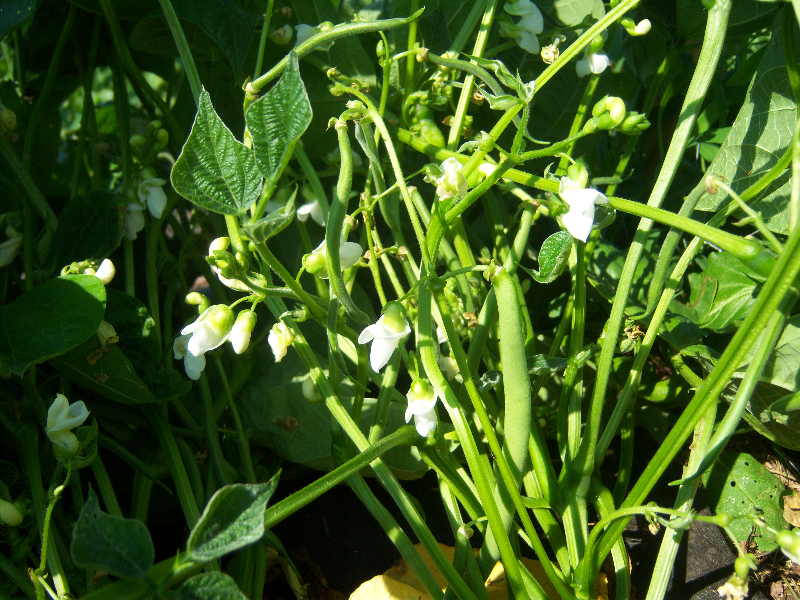 These are the variety Cherry Belle, a smaller radish with a mild flavor. Funny we never buy radishes at the grocery, but I always look forward to the clean, fresh taste of these right out of the garden. We have lettuce, spinach, onions, peas, broccoli and Brussels sprouts all doing nicely in the garden right now. 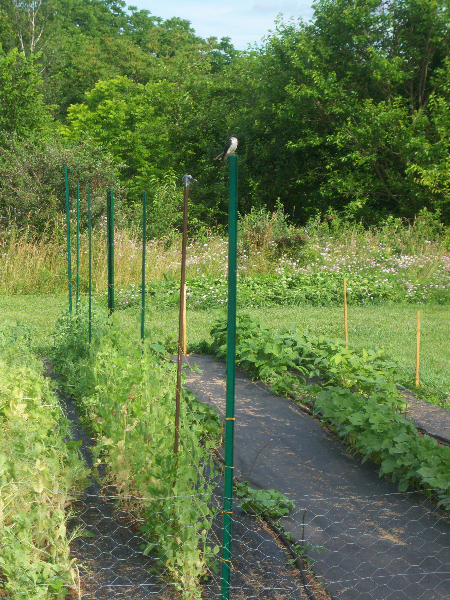 We seem to have a lot of rabbits in our area this spring so we are putting up fencing around the 2 large garden plots. The fence is really to keep the chickens out, too. They love to scratch around in the nice loose soil and I’m sure they would eat all the tender greens sprouting up if given the chance. They have not been getting their free range time for the last few weeks so we need to get that fence up ASAP.